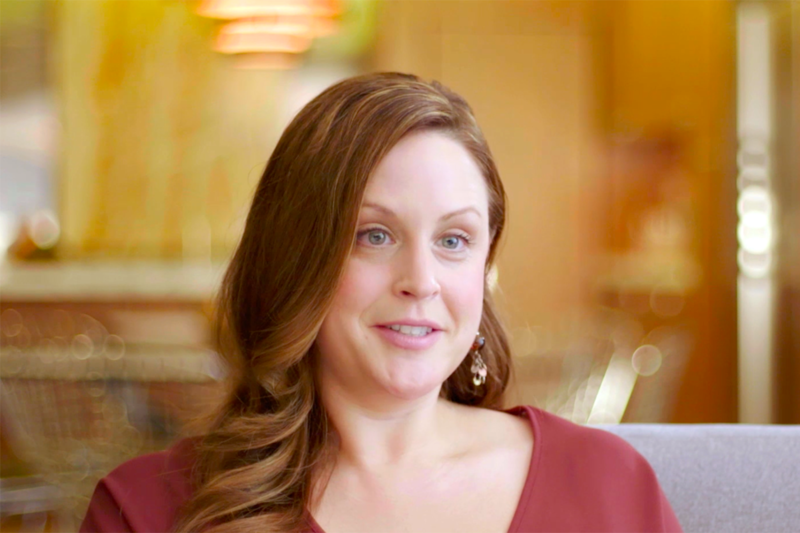 She had psoriasis since age 15 — "I was covered from head to toe" — was diagnosed with psoriatic arthritis symptoms at 25, but received no official diagnosis of that condition until she was 50. Diane Talbert of Waldorf, Maryland, says doctors initially told her it was "all in my mind." It wasn't. Diane, a devoted wife, mother and grandmother, now 60, has taken seven biologic medications during the last 15 years, and has successfully used one for five years, along with two pain medications. She was diagnosed with type 2 diabetes 10 years ago and with prediabetes for six years prior to that. She has persistently managed her weight for years, once losing 30 pounds — and does acknowledge the role some medications such as steroids have played in her weight gain. Now she takes oral metformin to control blood sugar, and she does her best to exercise and eat right. A blogger, patient advocate and speaker about psoriasis and psoriatic arthritis, Diane exudes boundless energy, a great sense of humor, and a desire "to live a long, happy life." If you also have psoriatic arthritis, you know that this condition, and psoriasis, may not be the only conditions you've been dealt. That's because "psoriatic arthritis is a complex condition," says Dafna D. Gladman, M.D. She is a professor of medicine at the University of Toronto, a senior scientist at the Krembil Research Institute at the University Health Network in Canada, and an internationally recognized expert on psoriatic arthritis. She cautions not to confuse manifestations of the condition — characteristic signs or symptoms of an illness — with comorbid conditions that may occur with it. "With disease manifestations, patients may not only have psoriasis, but nail lesions, peripheral arthritis in their hands and feet, and spondylitis in the axial or vertically-oriented joints of the spine and in the sacroiliac or SI joints," Dr. Gladman said in a telephone interview with HealthCentral. "About 50 percent of psoriatic arthritis patients have back involvement." In addition, two other components may comprise muscle manifestation of psoriatic arthritis, Dr. Gladman says. First is enthesitis, inflammation of the insertion point of tendons and ligaments into bone. Dactylitis can also appear as inflammation of an entire digit such as a finger or toe. 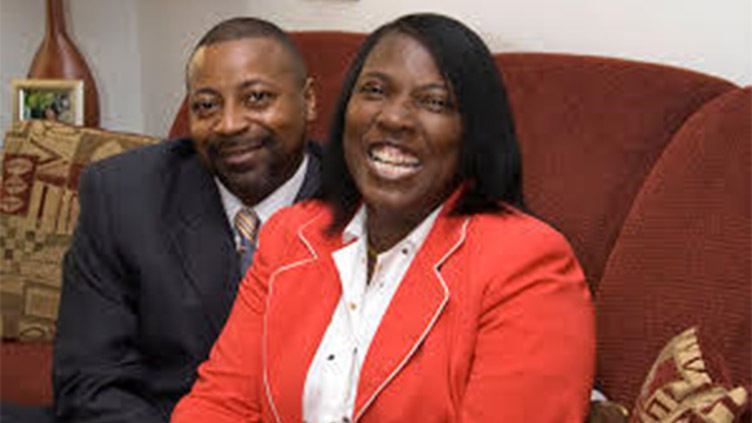 Diane Talbert smiles with husband Alvin at her side. Dr. Gladman says comorbid conditions are those are medical "entities" that co-occur in patients with psoriatic arthritis. The list includes diabetes, metabolic syndrome, fatty liver, coronary artery disease, depression, hyperuricemia or excess uric acid in the blood, usually implicated in the painful arthritis called gout. She explains more here. 1) Diabetes: This is directly related to the inflammatory condition psoriatic arthritis, and people with more inflammation in their joints are more likely to get diabetes, she says. A 2017 study in the Journal of Rheumatology, for which Dr. Gladman was a co-author, found that prevalence of diabetes is higher in patients with psoriatic arthritis than for the general population. Moreover, the degree of inflammation was a predictor for the development of diabetes. 2) Cardiovascular or heart disease: "We know from a mortality study done 20 years ago that the major cause of death with psoriatic arthritis patients was heart disease — but it's also true in the general population. In another study done almost 10 years ago, we found increased risk of heart attacks, angina, and hypertension or high blood pressure in patients with psoriatic arthritis. In addition to the usual risk factors, the extent of psoriasis was also a predictor of developing cardiovascular disease." There's no shortage of scientific literature that confirms the association between psoriatic arthritis and heart disease. See the International Journal of Rheumatology from 2012, and from 2014, a study in the Annals of Rheumatic Diseases, with Dr. Gladman as a co-author, that found exposure to an increased burden of inflammation associated with more severe atherosclerosis in patients with psoriatic arthritis. 3) Depression: It is more common in patients with psoriatic arthritis than those who only have psoriasis. "The number of actively inflamed joints is associated with anxiety and depression," she says, citing a 2014 report in the Journal of Rheumatology that she helped develop. "But even in patients with psoriasis without arthritis, depression is related to the degree of inflammation. " The presence of anxiety and depression interferes with patients' ability to achieve minimal disease activity, she says. "We want to have close to remission. We don’t know what the relationship is in terms of causation, but we know there is an association between psoriasis, psoriatic arthritis and depression. Maybe it's the effect of the disease, which is understandable." Please don't ignore depression, she says. "It interferes with the ability to treat and to achieve treatment goals." 4) Hyperuricemia: Researchers have wondered whether this condition and gout are more common in people with psoriatic arthritis. "Psoriasis has a very high turnover of skin cells that may increase uric acid in the body as it's released from cells," says Dr. Gladman. "We ask, 'Do patients get more gout because of that turnover, or because they have diabetes and metabolic syndrome?'" An early 2018 study in the Journal of Rheumatology, which Dr. Gladman co-authored, confirms that hyperuricemia is common in patients with psoriatic arthritis, especially when they've had the disease for a long time, and when they're obese. The researchers urged "proper control" of the condition and of metabolic diseases. 5) Obesity: Obesity is a risk factor for psoriasis and psoriatic arthritis, and people who are obese are likely to be more resistant to treatment, she says. Obesity interferes with the response to medications. Dr. Gladman participated in a 2015 study published in the Annals of Rheumatic Disease that confirmed that overweight and obesity make it harder to achieve sustained minimal disease activity versus normal-weight patients. "Fat cells produce cytokines that promote inflammation," she says. "If a person is genetically predisposed to psoriasis or psoriatic arthritis, all they need 'is one more thing.'" A 2016 Turkish study in the journal Postępy Dermatologii i Alergologii also documented a relationship between psoriatic arthritis and high BMI (body mass index), high waist circumference, meaning the measurement of your waist, and "psoriasis area and severity index." An earlier 2008 paper in the Annals of Rheumatic Disease also cited increasing BMI as being associated with increased heart disease risk in patients with rheumatic diseases. 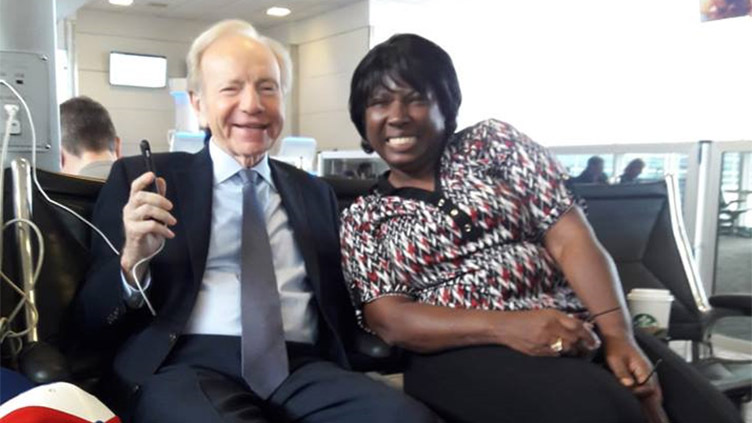 Here, Diane Talbert keeps good company at the airport with former United States Senator Joe Lieberman of Connecticut, also U.S Vice Presidential candidate in the 2000 election. Please try to lose excess weight, says Dr. Gladman. There's a lot riding on your proper weight here — your quality of life. Stop smoking, get enough recommended exercise, and take medications as directed. "This is your life and you have some control here if you make the right choices," she says. Other patients with psoriatic arthritis say you really can take a lead in helping guide your care. Communicate with your primary care doctor like you do with your rheumatologist or dermatologist. Start with being aware of other conditions that could develop along with your psoriatic arthritis. Be vigilant about having open discussions about all of it with your rheumatologist and your care team. Ask about how to test to measure your blood sugar, and be smart about sugar intake. Stay on top of blood pressure monitoring and other diagnostics your doctor suggests to assess your heart health. Get treatment for your depression — you're not alone here and counseling and medications really do help other people. Talk about the possibility of gout and how to monitor hyperuricemia. Join a "Y" or gym, take some classes or get individual help. Consider a support group for weight loss and team up with a buddy for better success. Remember that when it comes to self-care, the more you know the more you can do.